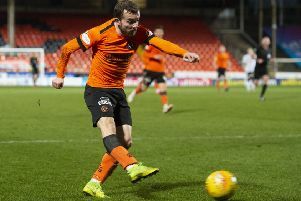 Dundee United manager Robbie Neilson was sent to the stand as his side threw away the lead and missed the chance to apply pressure on the Championship’s top two. Neilson, pictured, incurred the wrath of referee David Munro near the end but insisted he had been bawling at one of his players – not the whistler. The Tannadice boss said: “I shouted at one of my players. I was very vocal as I was disappointed and the linesman said I directed it at the referee. United suffered an embarrassing 5-0 defeat to league leaders Ayr United last Friday and Neilson unsurprisingly made three changes to his starting side. One of the incomers, Craig Curran, almost justified his inclusion early on when he came close to opening the scoring, weaving his way into the box only to scuff just wide. The visitors were in the ascendancy for the opening period and it came as little surprise when they grabbed the lead, Fraser Aird clipping an inviting ball into the area for Frederic Frans to loop a header past Derek Gaston. Morton looked a completely different side after the break as Jonatan Johansson’s message clearly struck a chord with his players while United’s attacking threat disappeared. After Aird blazed wildly over the crossbar, the hosts passed up a fantastic opportunity to level proceedings. A brilliantly worked move involving Michael Tidser culminated in Charlie Telfer failing to connect properly with a shot. However, Reghan Tumilty tapped home and was correctly flagged offside. A swirling wind and heavy rain perhaps played their part as Morton equalised, though Matej Rakovan should have punched Tidser’s corner to safety, the keeper’s error allowing Gregor Buchanan to head into an empty net on 78 minutes for his first club goal. The towering defender was then the hero at the other end as full-time approached when he made a brilliant intervention to deny Stewart Murdoch’s goal-bound effort.